Invisalign has gained tremendous popularity among our adult patients since its advent. Now, this revolutionary system is available for our younger patients, as well. Invisalign Teen, available at Smile Orthodontics, can successfully straighten teeth without metal brackets or wires, making it an excellent choice for those who wish to undergo orthodontic treatment discreetly. Replacement trays: Teens lead busy lives. Between work, school, and extra-curricular activities, your teen’s aligner trays are bound to be misplaced at one time or another. Invisalign Teen includes up to six replacement trays, free of charge. Progress indicators: The success of Invisalign is primarily dependent on patient compliance. Therefore, if your teen does not wear his or her aligners as often as necessary, it could result in longer treatment times. Invisalign Teen comes with built-in indicators. These can tell the patient, parents, and doctor whether or not the trays are being worn enough. Root movement: When moving teeth, it is sometimes necessary to shift the position of the roots. These trays have power ridges, which apply pressure at just the right points, moving the teeth safely into their proper positions. Extra space for growth: Traditionally, orthodontic treatment could be challenging due to ever-changing dentition. Invisalign Teen custom trays allow for extra space as the molars erupt, and actually guide new teeth into the proper locations. 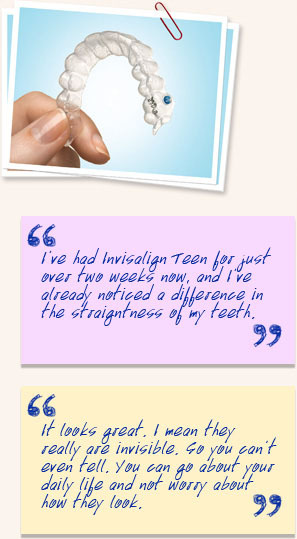 Invisalign Teen works the same way as traditional Invisalign. Your teen will wear his or her custom trays for about two weeks before switching them out for the next set in the series. The slight differences in each set of trays will help gradually guide the teeth. The trays must be worn a minimum of 22 hours per day, and they should not be removed except for eating, drinking, brushing, and flossing. Approximately every six weeks, your teen will visit our office for a follow up appointment. During this visit, the doctor will check your teen’s progress and give recommendations regarding treatment. Initial visit: During your teen’s first consultation, the doctor will perform a thorough assessment of the teeth and gums. He will then determine a custom treatment plan. Impressions: In order to fabricate the custom trays, impressions will be taken of your teen’s teeth. Receiving the custom trays: The Invisalign lab will craft the trays, and deliver them to our office. Once we receive them, we will schedule a visit so your teen can try in the first set of aligners. Treatment can begin immediately. Active treatment: The doctor will give your teen specific instructions for wearing the trays. Typically, they will be switched out for the next set every two weeks. Maintenance: After treatment is complete, your teen will need to wear a retainer to preserve his or her beautiful new smile and keep the teeth from shifting. What Issues Can be Treated with Invisalign Teen? Invisalign Teen can address a number of malocclusion issues, including overbite, underbite, crossbite, open bite, crowding, and spacing. It should be noted, however, that Invisalign has limitations. While this method is extremely useful for straightening teeth, it does not address all issues of function and health. Therefore, if your teen has more severe orthodontic issues, it may be best to consider traditional treatment for long-term success. Our doctors can help you determine which treatment option will yield optimal results for your teen. If you are considering orthodontic treatment for your teen, Invisalign could be an excellent option. To find out if your teen qualifies for this treatment, schedule a consultation at one of our Suffolk, VA office locations. You can call us, or contact us online anytime.